After a season of throw one in games Stan Ternent set about strengthening his defence in the summer of 2003 ahead of what was to be his last season as Burnley manager. 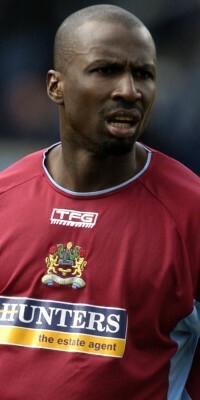 His first signing, confirmed a week before the end of June, was Wolves left back Mo Camara. His fellow countryman Drissa Diallo had recommended the Clarets to him but by the time Camara signed on the dotted line Diallo had moved to Ipswich and the pair would not play together in a Burnley side. The Wolves fans told us he was quick and would become a crowd favourite with his exciting runs forward and one Wolves fan said: "He's a headless chicken with exhilarating pace. "He can run like hell but sometimes forgets to take the ball with him." They warned he was not the best of defenders, and given our previous season that was a worry. His professional career had been spent exclusively in France until Wolves signed him from Le Havre in the summer of 2000 and he made his debut for Wolves at Molineux club against Burnley early that season, coming on as a late substitute for Temuri Ketsbaia in a game that Burnley were very unfortunate to lose. He didn't feature too much in that first season, but established himself in the side in the following season as Wolves reached the play offs. But disaster was around the corner, he suffered a cruciate ligament injury and after recovering failed to get back in the side as Wolves won promotion to the Premiership. Camara was keen to stay at Wolves but heard nothing from them regarding a new contract. He was in demand and received offers from Bradford City and Oldham as well as Burnley, and finally accepted our offer of a two year contract. He was everything the Wolves fans said he was, the crowd did seem to love him, but he turned in some horror performances in a hardly improved Burnley defence as we battled against relegation. In December Jay McEveley was brought in and finally replaced him in the side for the FA Cup tie at Mansfield only to be stretchered off with a knee injury himself. That allowed Camara back into the side and it was two rounds later in the cup at Millwall that proved a real low point for him, finding himself racially abused during the game. Throughout the season he missed just one league game, at Coventry, and that because of suspension. We survived that season, and so did Camara as he lined up in Steve Cotterill's side at the beginning of the 2004/05 season. They'd done extensive work on him during the pre-season to try and improve him and he looked a different player. Still not the best defensively, he was much more dangerous going forward, and when Aston Villa visited in the League Cup he scored his one and only Burnley goal. His team mates struggled to catch him as he went off on his goal celebration. His performances dipped but again he played in all but one of the games, this time missing the home game against Leicester. He convinced the manager that he was worth another contract but when talks stalled Cotterill had had enough and released him. There was talk of him going to Celtic, but it all seemed a bit far fetched. However, that's where he went becoming Gordon Strachan's first signing as Celtic manager. He had a torrid debut against Artmedia Bratislava but was first choice left back at Celtic Park until November. Eventually he found himself third choice behind two players who were only covering in the position, Ross Wallace and Mark Wilson and he found his opportunities very limited. From the end of November he made only three first team appearances and with little sign of an improvement he joined Derby County just after the start of the 2006/07 season. Again things started well for him but he lost his place in early November, won it back in January. He was involved in a couple of unsavoury incidents when we went to Pride Park but worse was to come. Just as the transfer window was about to close Derby signed the only player who took his place at Burnley, Jay McEveley. Camara hasn't played a league game for Derby since and missed out on the promotion via the play offs. In November of 2007, having played in just one league game for Derby since February he moved to Norwich City on loan with a view to the deal being made permanent in the January transfer window. Although he remained at Norwich and played a total of 21 league games for them, his move was never made a permanent one and at the end of the 2007/08 season he returned to Derby. Unlikely to break into Paul Jewell's team he signed for Blackpool on 5th August 2008 on a month's loan to cover for injuries to Stephen Crainey and Joe Martin. The loan was extended by a further month with Crainey still out injured. He eventually remained with Blackpool until the end of 2008. On his return to Derby he went straight back into the team and played in three games including the first leg of their Carling Cup semi-final against Manchester United at Pride Park. However, it proved to be a false dawn and his contract was terminated during the January transfer window. In mid-February 2009 he enjoyed a trial with Leeds United, managed by Simon Grayson who had taken him to Blackpool earlier in that season, but whilst Leeds were considering things he opted to sign for St. Mirren until the end of the season with an option for a further season. Illness and injury in the first half of the 2009/10 season restricted him to just one appearance, the first game of the season. On 27th January 2010 St. Mirren asked him to terminate his contract and he left the club immediately. Mo was without a club for just just over two weeks and on 11th February 2010 he returned to England and signed a contract until the end of the season with League Two club Torquay United.